Why Subscribe to the Human Life Review? Still need convincing? See below for other reasons! 1.) A balanced mix of great articles focusing on life issues. treatises and thought experiments. We have even published short fiction pieces and pro-life movie and play reviews. 2.) Comprehensive knowledge of the facts. The next time a discussion on life issues comes up with family or friends, you will be armed with not only in-depth knowledge on the ins and outs of the legal, political, and philosophical landscape of the Right to Life movement, but new insights on how to win over minds and hearts. The Human Life Review is one of the most up-to-date publications in the Right to Life movement. In addition to original articles, we feature an appendix section which reprints the most current and important magazine columns, book reviews, and/or news reports from around the world. 4.) The benefit of forty years’ experience and confidence in the most trusted Right to Life publication on the planet. The Human Life Review isn’t a start up blog. We have been publishing since our founder, James P. McFadden opened our doors in 1975. The Human Life Review has been called “THE locus of civilized discussion of the abortion issue”, and it is that academic and intellectual discussion that for which we are we are internationally renowned. 5.) Wise, informative, and inspirational words from some of the biggest names in the Right to Life Movement. 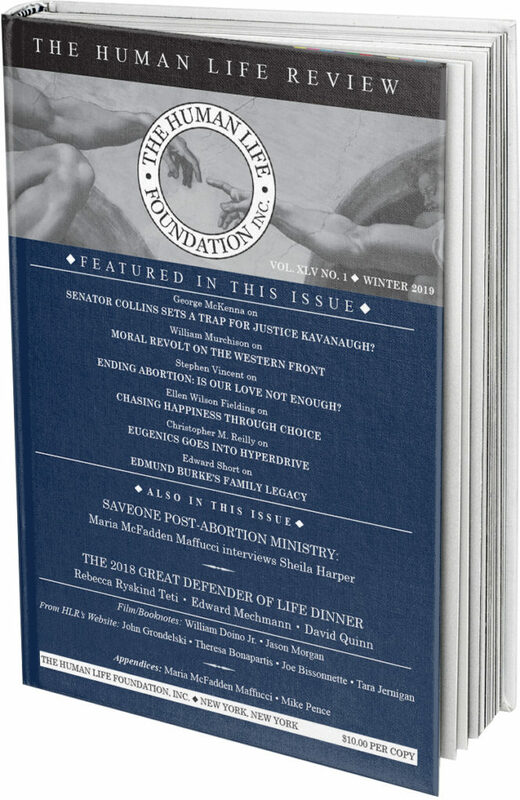 The Human Life Review has had a star-studded list of contributors, including Hadley Arkes, Mary Ann Glendon, James L. Buckley, James T. Noonan, Paul Greenberg, Cardinal Timothy Dolan, Congressman Paul Ryan, William McGurn, Nat Hentoff, George McKenna, Wesley Smith, and our senior editors William Murchison, Ellen Wilson Fielding and Mary Meehan (and in our archives, Clare Booth Luce and Malcolm Muggeridge, James L. Buckley, Cardinal John J. O’Connor, and Congressman Hyde). Subscribe to the Human Life Review Today! 5,319 people have visited this page. 1 have visited this page today.